Restaurant Deals and Discounts on Things to Do In Lake Havasu City is Here! We were thrilled when the Shopper’s site 928Shopper.com launched in August. Finally, Lake Havasu City has a source for deals onLake Havasu’s best restaurants, spas, nightlife, massages, salons and local events. You can purchase vouchers for your local favorites and the site features coupons too! That’s right, all of the coupons in the Shopper that Havasu residents get in their mailbox is also available online. Because the site is fully responsive you can easily browse and use your favorite coupons on any device. Whether you want to print the coupons from your computer or pull them up on your phone, all of the deals and coupons can be accessed anywhere. There is even a feature to add coupons to your coupon list to print a page of just the coupons you want. 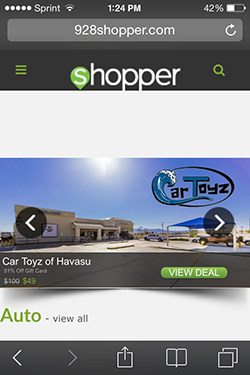 You can always get the latest Havasu deals by signing up for the Shopper Newsletter or liking the Facebook page. The dining deals sell out fast, so you will want to get the notifications as soon as you can. When you purchase a deal from 928 Shopper you become a member of the 928 Shopper Club. Members get 24 hours advanced notice of new deals and jump on getting their vouchers! Don’t take our word for it, go to 928Shopper.com and check it out for yourself! Stop paying full price and start saving on Havasu deals now!